This is going to have to one of those "short and to the point" posts. I'm heading off to St. Louis to do a technology presentation for a group of librarians and need to hit the road (it's storming - yuck!). Preheat oven to 350 degrees. Spray a cookie sheet with no stick spray or line with parchment paper. Mix milk and egg white in shallow bowl. Mix spices and Bisquick in separate shallow bowl. 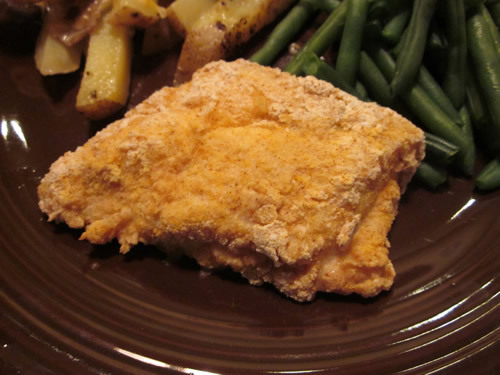 Dip each chicken breast into the egg mixture, and then dredge in Bisquick for form a coating. Place chicken on baking sheet. Spray lightly with olive oil in a mister bottle. Bake 40 minutes, until crust is golden. Mix cracker crumbs and Parmesan on plate. Rinse chicken with cold water; gently shake off excess. Dip chicken in crumb mixture, turning to evenly coat both sides of each breast. Discard any remaining crumb mixture. Heat a large nonstick skillet on medium heat sprayed with olive oil. Add chicken; cook 5 to 6 minutes on each side or until done. Transfer to plate and cover to keep warm. Add broth, chives and cream cheese to skillet; bring just to boil, stirring constantly. Cook 3 minutes or until thickened, stirring frequently. Spoon over chicken and serve. What a great week I had! We didn't have any snow days and the temperatures were in the low 60s all week! I had fun making "biography stew" with my second graders in library this week. And to top it all off, I had a wonderful birthday dinner date with my husband on Friday, my son won first place in the math contest on Saturday, and I got to go for a 16 mile bike ride on a beautiful, sunny day. Life is good! I made a new soup for my lunches this week that is really tasty, but you have to be a cabbage lover to appreciate it. 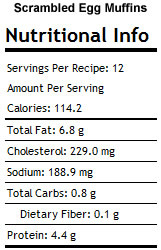 It's hearty and tasty, makes 14 cups of soup, and is only 113 calories a serving. Be sure to give this one a try. Here's a different take on pizza for dinner. You could substitute your favorite pizza toppings if you don't like pepperoni. Poke holes in potatoes with a fork, wrap in foil and bake for about 45-55 minutes. Remove from the oven and let cool. Once cool, slice a thin slice off the top of the potato and scoop out the flesh. Be careful not to poke holes in the bottom (it’s okay if you do – it happens!). 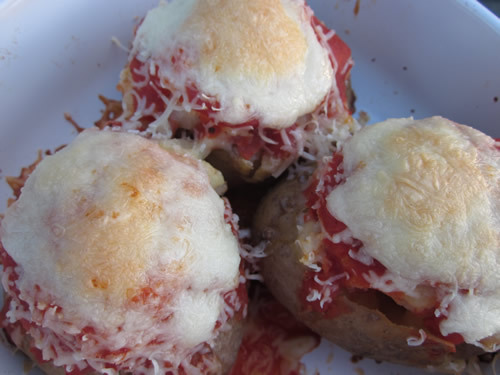 Put scooped potatoes in a bowl and mix with 2 oz mozzarella and pepperoni. Mix well. Scoop mixture back into potatoes and spoon pizza sauce over top. Sprinkle with remaining 1 oz cheese. Bake for 10-15 more minutes or until cheese melts. This hearty stew is low in calories and high on taste. Brown sausage in large stock pot. Drain, discard fat, and set aside. In the same pot, add the minced onion (save the sliced onion for later) and saute for 3 minutes. Add garlic and cook for another minute. Add the white wine and the beans and bring to a rolling boil. Reduce to a simmer. Cover and cook for 10 minutes. If you want a thicker base to your stew, use an immersion blender to blend some or all of the beans and onions. 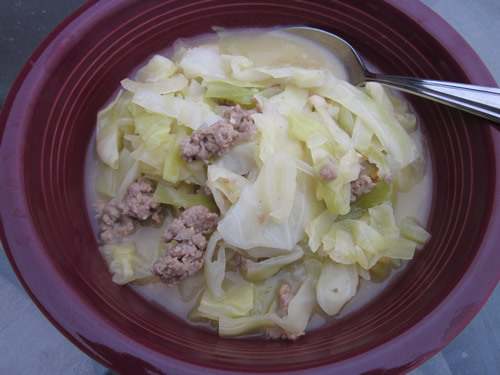 Add the water, stock, cabbage, sliced onion, bay leaves and browned sausage. Bring to a boil; reduce heat to a simmer. Cover and simmer for 10 minutes, then uncover and continue cooking until the cabbage is tender, about another 10-20 minutes. To serve, sprinkle on chopped parsley. Believe it or not, we were of school again this week for snow! It snowed on Tuesday night, and we were out the rest of the week. This is the most snow our area of the country has had in years! We've only had two weeks in January and February that we went to school all five days. And today, it's 60 degrees, with the forecast for Thursday saying 68! Crazy Missouri weather - gotta love it! Because of my bonus days, I got to do some extra cooking. I made very tasty cupcakes for Valentine's Day, and I created the most spectacular soup recipe ever! I'm not kidding! 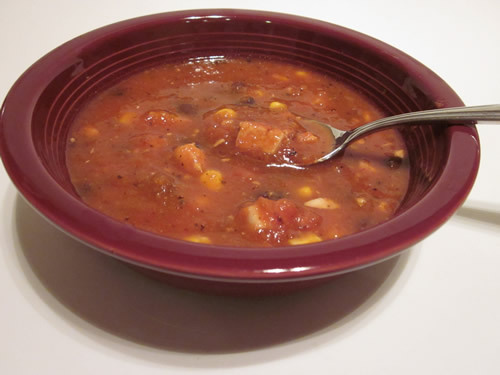 You must give my Fire Roasted Chicken Tortilla Soup a try. This week is a fun week for me. Monday is Valentine's Day and Friday is my birthday. You gotta love having two special days in one week! And, Corey has a math contest on Saturday. Eric and I love math contest day. We are always amazed at what those kids can do that we can't! Whisk together the masa and water in a small bowl and add to the pot. Add chicken, beans, and corn. Simmer for 30 more minutes. Combine cake mix and dry gelatin mix in large mixer bowl. Add applesauce and 3/4 cup strawberries and beat with mixer until well blended. 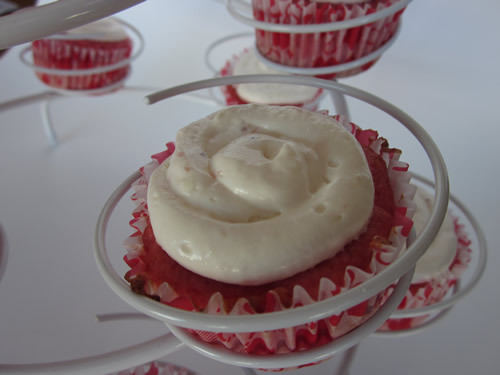 Pour batter into into 24 cupcake cups lined with paper liners. Bake 18-22 minutes or until toothpick inserted in center comes out clean. To make frosting, beat cream cheese in large bowl with mixer until creamy. Gradually beat in sugar. 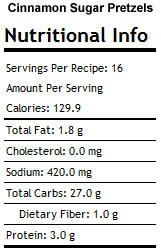 Add drained 1/4 cup berries; mix well. Whisk in Cool Whip. Frost tops of cupcakes. My husband says these are restaurant quality desserts. I think it's amazing what putting smaller portions in a fancy glass can do for a dessert. 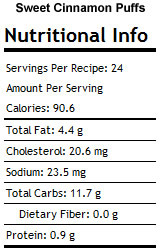 This definitely tastes rich and decadent, but its just about 200 calories a serving! Plus, they are super easy to make. 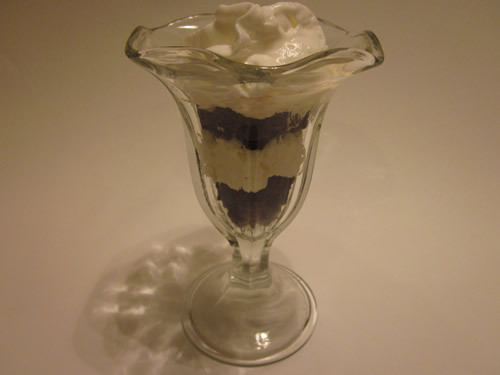 You will need four individual dessert glasses to layer the trifle ingredients. If you don't have a dessert glass, you could use a wine class or small drink glass. Cut each brownie in to very small cubes. Keep portions separate for easy dividing. Beat milk, pudding mix, and whipped topping in medium bowl with wire whisk 1 minute. Mixture will be thick. 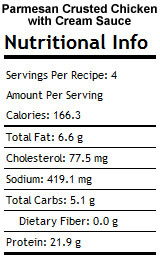 In dessert glass, put the equivalent of 1/2 of a brownie in the bottom of the glass. Add a layer of the pudding mixture (about 2 T). Add the rest of the brownie, and then another layer of pudding. 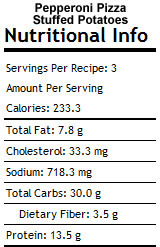 Top with whipped topping and chocolate chips if desired (adds additional calories). This sounds like it should be a very heavy, fattening dish, but by using the right ingredients, I've made it one that fits in with my family's healthier eating style. The bacon and ranch flavors make this an outstanding pasta dish that everyone in your family will love. Cook bacon in microwave safe glass dish lined with paper towels. Cover with paper towel and cook on high three minutes or to desired crispness. Chop in to small pieces. Set aside. In a large nonstick skillet, cook chicken until lightly brown. Sprinkle flour and salad dressing mix over the chicken and stir will. Stir in milk. Cook and stir until thickened and bubbly. Add bacon and stir. 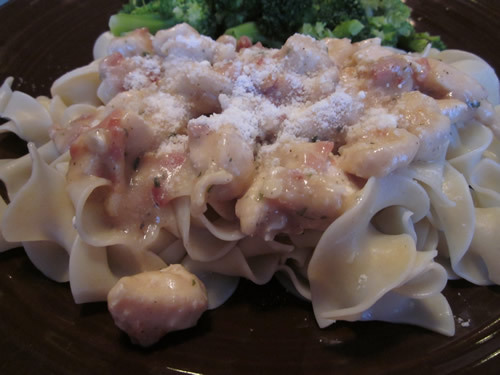 Serve chicken mixture with noodles. Sprinkle with Parmesan. Here are some pictures of our snow! While were trapped at home, my son did a blog makeover for me and designed a beautiful new header for me. :) What a great kid! I had my old one since 2007, so it was time for a new look. I also finally set up a Facebook page for the blog so people can get updates easier. I know that more of my friends use Facebook than they do feed readers, so I thought it would be a good thing. 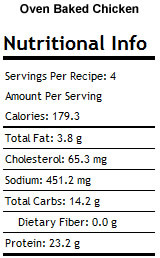 Be sure to check it out and "like" the page at http://www.facebook.com/mealplans. Like everyone else who was snowbound, I baked some yummy goodies while trapped in the house. 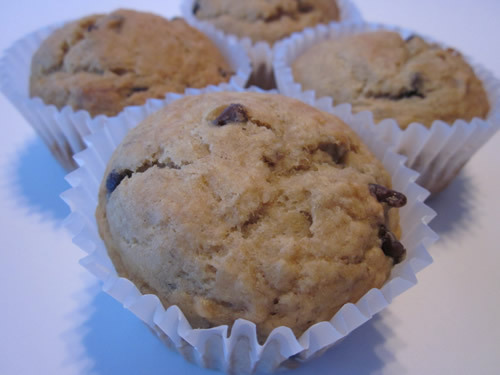 The next time you have a snow day, you've got to try these banana chocolate chip muffins. 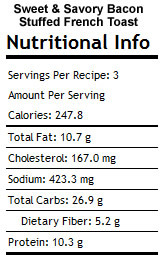 They are wonderful, and you would never guess they are low calorie and low fat. Be sure to try one fresh from the oven. Tonight was Super Bowl Sunday. Even though I don't care for football, I do enjoy having friends over for dinner. :) I made some simple finger foods for our "party". The Oven-Baked Bacon Cheese Dip and Cinnamon Sugar Pretzels were big hits with my family. We also had a veggie tray and Pepperoni Pizza Puffs. This week's menu has lots of comfort food favorites. I spent a lot of time today cooking ahead for the week in case we do actually get to go to school all week. I decided to stop posting my breakfasts and lunches. It just takes too much time. 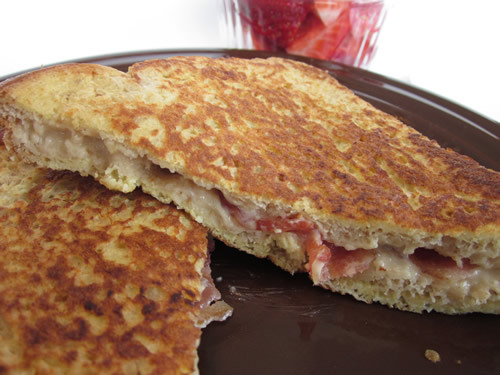 I did make a spectacular breakfast today that you have to try - Sweet and Savory Bacon Stuffed French Toast. Doesn't the title just make your mouth water! Yum! 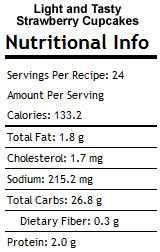 I am still posting the nutrition information on each of the recipes I post, so I hope you find that useful. Here's this week's menu. Enjoy and have a great week! These spectacular muffins will satisfy your sweet tooth without forcing you to eat a ton of calories and fat. 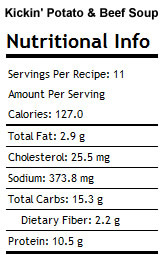 Each muffin has 138 calories and 2 grams of fat. Not bad for a sweet treat! Preheat oven to 350 degrees. Line muffin tins with muffin papers and set aside. In a large bowl, whisk the flour, brown sugar, baking soda, baking powder, and salt. Mash the bananas in a bowl and mix in applesauce. Add to the flour mixture. Stir until combined. 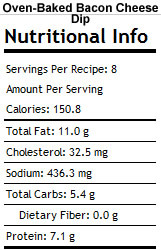 Add the chocolate chips and combine again. Fill the muffin papers almost to the top. Bake for 20 minutes rotating the pan once during baking. Let cool in the pan for 5 - 10 minutes then serve. 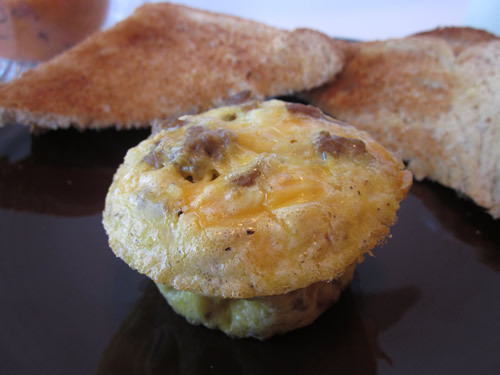 These are a great protein-filled breakfast item. I like to make them ahead and store them in the fridge to eat throughout the week. You just heat them for 30 seconds in the microwave to warm them. Serve them with a low calorie, high fiber English muffin to get a great protein-carbohydrate combo to get your morning off to a great start. Add a side of fresh fruit to make it even better! Brown sausage in a nonstick skillet; drain any fat. In a large mixing bowl, beat the eggs. Add the onion and seasonings. Mix in the sausage and cheese. Add 1/3 cup of mixture to greased muffin cups. Bake at 350 degrees for 20-25 minutes or until a toothpick inserted in the center comes out clean. These are a sweet tasty treat to enjoy with breakfast, a snack, or dessert. Each puff is about 90 calories. Preheat oven to 350. Place butter, sugar, and egg in a large bowl and mix. In a separate bowl, sift together flour, baking powder, salt and nutmeg. Add dry ingredients and milk alternately, ending with milk. Spray a mini-muffin pan with cooking spray. Fill each muffin cup 3/4 full (I use a small cookie scoop to make this easier) and bake for 15 to 20 minutes until golden brown. Remove from the oven. Roll the hot muffins in melted butter, then in the cinnamon-sugar mixture. This is one of those breakfast treats I make when I'm in a "bed and breakfast" kind of mood. You know, one of those days when you get the luxury of sleeping in and not setting the alarm, and you just feel like having a spectacular breakfast. I know this sounds pretty decadent, but with some careful use of healthier products, this is actually a breakfast you can splurge on now and then. It's definitely one to pull out for special breakfast occasions. Pair it with some fresh strawberries or a fresh cut grapefruit and you have a spectacular breakfast that your family will love. Cut bacon slices in half. Place slices in glass baking dish lined with paper towels. Cover with paper towel and microwave 2 minutes or until cooked to desired crispness. Combine softened cream cheese, brown sugar and syrup in a small mixing bowl. Beat with electric mixer until fluffy. Spread the cream cheese mixture on one side of each slice of bread. Add 4 half slices of bacon on 3 of the bread slices. Top with the other slice of bread, cheese side down. Whisk together eggs and milk in a shallow bowl. Preheat non-stick skillet or griddle (you can spray it with cooking spray before heating if desired). Dip both sides of the sandwich into the egg mixture. Cook 3 to 5 minutes per side until golden brown. Put pretzels and oil in a large ziplock bag. Shake to coat pretzels with oil. 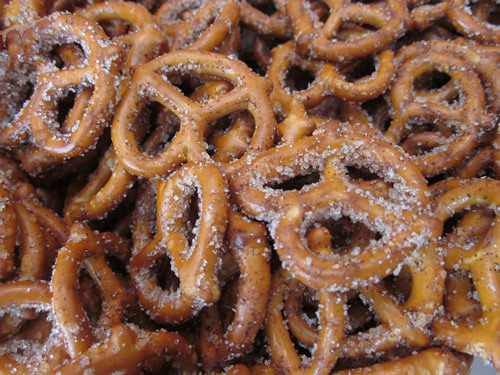 Add sugar and cinnamon to the bag and shake again to coat pretzels. Place coated pretzels on a cookie sheet covered with parchment paper. Bake uncovered, in a 300 degree F oven for 30 minutes, stirring twice. Spread on waxed paper to cool. Store in an airtight container. 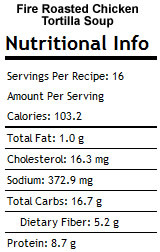 Makes 16 one ounce servings. 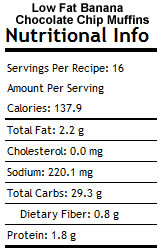 This is a great dip for your Super Bowl party. How can you go wrong with warm, gooey cheese topped with bacon? 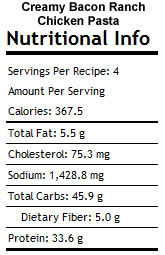 By using low fat dairy products and lean bacon, the calorie count won't make you fumble either! 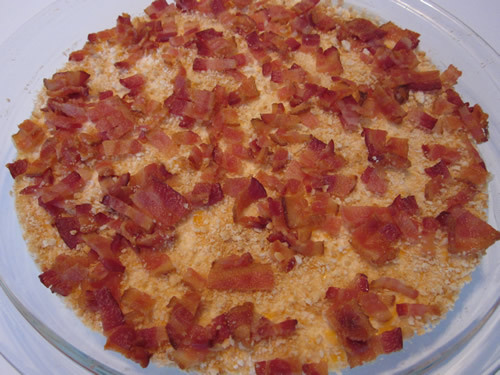 Place bacon slices in glass baking dish lined with paper towels. Cover with paper towel and microwave 3 minutes or until cooked to desired crispness. Cool and crumble. Set aside. In a medium bowl, combine the mayonnaise, cream cheese, cheddar cheese, green onions and cayenne pepper until well blended. Transfer the mixture to a small baking dish or pie plate and spread evenly in the dish. Top mixture with cracker crumbs and bake for 15 minutes, or until heated through. Remove the pan from the oven and top with the bacon. Serve immediately with crackers or veggies. 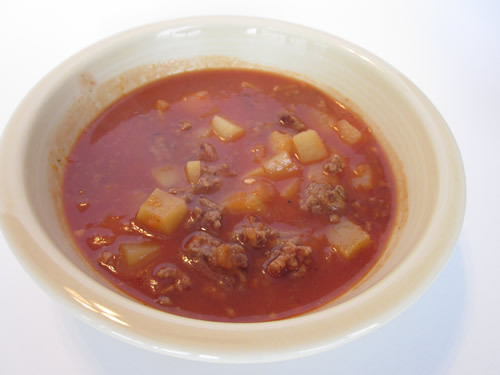 This is a nice hearty meat and potatoes kind of soup that gets a little kick from the hot sauce. It's a great one for these cold, snowy days. 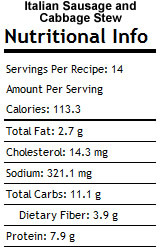 The best part is that it's only 127 calories per cup! In a large soup pot, brown ground beef over medium heat until no longer pink; drain. Add the potatoes, onion, garlic and tomato sauce. Stir in the water, pepper and hot pepper sauce; bring to a boil. Add bay leaf. Reduce heat and simmer for 1 hour or until the potatoes are tender and the soup has thickened.Remove bay leaf before serving.